Another election has come and gone. Some people, presumably, are delighted, while others are filled with gloom. OK, it was mostly gloom on my Facebook page. Maybe you worked really hard on behalf of a candidate you truly believed in, and that candidate didn’t win. Maybe the one who did win is the worst kind of corrupt imbecile, totally in debt to the moneyed interests. Maybe you feel like the country is going to hell in a hand basket, and we are all at the mercy of people who think that Ebola is washing our shores on a wave of Black people and climate change is a hoax invented by scientists who want to further their careers. It could be that we are doomed, and if your plans for this week should happen to include an adult beverage or a childhood comfort food, well I wouldn’t blame you. But eventually we always come round to the question of what now. Now that the election is over and we get a break from the ads. Now we know just how vehemently we might disagree with our neighbors or family members. Now that the whole cycle of hope and possibility and things not ever living up to their potential starts over again. Now what? The same thing as always. Sorry, but I don’t have a better answer. Now we make dinner and pet the cat and read the kids a story and decide what to wear to work tomorrow. Now we look for a job that will pay the bills or an apartment that won’t break the bank or a date who won’t turn out to be a complete waste of time. Now we call our friends to comfort them or be comforted. Now we wait to hear back from the doctor or we wait to hear whether there will be an indictment from Ferguson. We visit the rest home, we take the children to soccer or to dance, we cry or look at videos of cats. Maybe we remember other elections that swept us up in a tide of hope or despair, and we remember how after those elections we kept on doing what we do. I’m in no way saying that elections don’t matter, or that it’s not worth being deeply engaged in the political process. The government sets policy, and those policies affect really important things like who gets deported, who gets health care, whether people can manage to live on minimum wage, what efforts are made to combat climate change, what kinds of transportation we have access to, whether there is funding for research, what is supported and not supported in our schools, and on and on and on. Politics matters. Having a voice matters. Speaking up for your hopes matters. But it doesn’t necessarily matter in the way that we would like. Paying attention and voting and making calls and writing letters and campaigning door to door doesn’t always result in the person or policy we support winning. And, sadly, even if they do win it rarely means that everything is rosy and the world is organized the way we would organize it. Whether we get what we want is not what defines our efforts. We are called to care, and to love and to work for justice. Whether or not things go our way at any given moment. 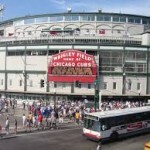 I used to serve a church in the same neighborhood as Wrigley Field in Chicago. Although I am not, myself, a baseball fan, I learned a lot from my Cub-loving congregants. The Cubs lose. Everyone knows that. Historically, currently, the Cubs are just not what you would call a winning team. Which doesn’t stop the fans from rooting for their beloved Cubbies, year in and year out. You love what you love, and you go out and yell on its behalf, following the statistics or the players or whatever markers of success or defeat you might have. You show up and cheer. When your team wins you get a parade. But when your team loses you have the opportunity to gather with your friends and mourn the losses and plot how next year will be better. Or maybe two years from now, when elections roll around in 2016.